This made me track down a movie I loved as a kid about a polar bear that was totally based on Cupid and Psyche. This is one of those books you hear about and then buy in a used bookstore and it languishes on your bookshelves for years until you finally pick it up, and then you just end up thinking to yourself, why didn’t I pick this up sooner? Only, it’s also one of those books that really works better as a reference than as a book you sit down and read from cover to cover. I read this book over the course of most of February, in bits and pieces, and it worked well that way. This book is a classic for a reason. 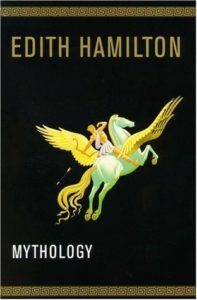 It’s at once a primer on world mythology and a pretty exhausting compendium of pretty much any myth or godlike figure you’d want to know about (with an emphasis on western mythologies, which is a bit of a shame; I would have liked to see what Hamilton would have had to say about eastern myths, or African ones). But my favorite bits were actually her little insights here and there into how the mythology was influenced by the historical culture of the times. I loved when she took little digs at historical writers, like Sophocles or Pliny or whoever. There was this one guy, whose name I’m forgetting at the moment, whom you can tell she just despised, but was too polite to say. And this dude lived 2,000 years or more before she did! Hilarious. She spends the most time on Greek mythology; it seems to be her favorite. And she made the claim in one of the intros that the Greeks’ mythology was different from the others, because reasons. At that point I was like, okay lady, but maybe its just your favorite and you’re kind of biased. Anyway, definitely a valuable book to have on my shelves. Read Harder Challenge 2019: A book of mythology or folklore. Share the post "This made me track down a movie I loved as a kid about a polar bear that was totally based on Cupid and Psyche." I love this book! We used it in English class all through junior and senior high, and I keep it on my shelf as a reference. Totally agree about her editorializing about sources and writers being part of the fun. It would honestly have been super helpful to have when I was younger. Oh well! I was really lucky to have that teacher (for many other reasons, too). She loved Greek mythology, so we kept up with it every year. She even had us play “Greco” in class, a Greek mythology version of Bingo, to keep it all fresh in our minds.